In this Farming Simulator 2015 review you will discover the game is hours of fun. You will manage and grow a farming business, including driving over 140 vehicles, managing and caring for livestock including chickens, sheep and cows. Harvesting your crops and of course, making money in the process. If you’re ready to get your friends involved there is an online multiplayer mode. 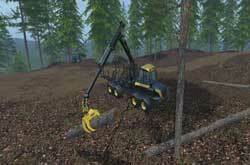 The biggest improvement since the release of FS 2013 is the addition of forestry tasks. 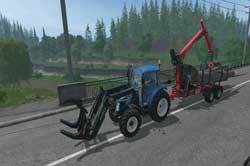 With new forestry machinery to master and a quick way to make more money, forestry is sure to be one the most enjoyable parts of this release. New graphics and an updated physics engine have solved a lot of the issues with realism found in past releases. As you go about building your farming business you can immerse yourself in game play with smoother, more realistic graphics. As a beginner it can be challenging to get started. You will find yourself seeking guidance from other sources to help you master even the basics of running the farm. There are some basic tutorials included in the game, but having the tutorial running on screen limits the game play environment significantly. I recommend finding tutorials on external sites, like this one, to help guide you in the best machinery to start with, the best crops to grow or animals to keep. After choosing which farm to start your career on, Scandinavia or America, you are given enough equipment and a handful of fields to start sowing and harvesting. I chose to sell my equipment and replace it with forestry tools and machinery. I found the forestry tasks helped me generate more cash, more quickly, so I could buy new machinery and expand my farm really fast. Forestry is my favourite part of this game, but it takes some time to master the equipment controls. Once mastered it’s great fun and you can make a lot of cash very quickly. With over 140 vehicles to choose from you want to be sure you are buying the right machinery for the job at hand. If you’re planting crops, make sure you have enough cash to buy the equipment to harvest them or you will be wasting time and money. Only buy the machinery you need, you will have to pay to maintain and repair it. Even if you aren’t using a piece of machinery it still needs to be maintained and you will see your cash reserves going down to cover the cost. As your business grows you will need some help to make sure that all jobs are done at the right time. You can employ staff to help you harvest your crops or look after your livestock. You can’t employ staff to do every task, some things like logging can only be done by you. Keep an eye on your team too! They’re not very good drivers and if they get stuck (in a tree for example) you will have to step in and help them out. I didn’t expect Farming Simulator 2015 to be as good as this. After playing 80+ hours I’m still finding it to be one of the most enjoyable games of the past couple of years. New content is being added all the time and with new maps and equipment the game will continue to expand. How can we improve this Farming Simulator 2015 Review? If you’ve got a question or comment add your thoughts in the comments below. I will be adding tutorials and game play videos in the coming weeks, but if you have a special request or question ask away, I review all comments and respond as quickly as possible.